View Your Medical Chart from Home! Matossian Eye Associates now offers you the ability to view your medical chart. You can visit our newly designed patient portal at www.matossianeye.com to set up your account. This is a free, secure option to access information from your doctor while in the comfort of your home or office. • Select "See Your Chart" and create a secure account. Back to School - Don't Forget About Your Eyes! Many kids trade their glasses in for contact lenses during the high school years. However, proper care for contact lenses is vital to avoid serious eye infections that can cause permanent visual impairment. New quarter, new case – Replace your contact lens case every three months will help keep germs at bay. Just say "no" to H20 – You should not swim, shower, or enjoy a hot tub with contact lenses in. Tap water should never be used to rinse or soak contact lenses. You snooze, you lose – Never sleep in your contact lenses. Even occasionally sleeping in contact lenses increases the risk of eye infection by 6.5 times. Unfortunately, a recent poll of nearly 100,000 people by BuzzFeed found that about 70% of respondents occasionally or regularly sleep in their contact lenses. It’s too late if you wait – Symptoms of eye infections include redness, pain, and light sensitivity, and should be examined by an ophthalmologist immediately. Waiting to get examined or treated could lead to vision loss. The structure of healthcare benefits has undergone major changes in the past few years. Therefore, it is more important than ever to understand the details of medical insurance policies. Providers used to be able to simply look at a patient’s insurance card and determine the benefits at a glance…those days are long past! There are so many different insurance plans that it is nearly impossible for providers to determine what will and will not be covered. Most patients do not understand their out of pocket responsibilities vs the services covered by their plan. This can lead to unexpected out of pocket costs which can cause unwarranted frustration by the patient towards the health care provider. When an eye care provider signs a contract with an insurance company, they are legally obligated to collect what that insurance states the patient owes. Coinsurance – the patient is responsible for a percentage of what the insurance allows for a service. For example, if the insurance allows $100, the patient would be responsible for $20, with an 80/20 plan. Individual plans vary. Deductible – the patient is responsible to pay a specific amount on a yearly basis out of their own pocket before insurance will cover anything. In order to avoid surprises, review your benefits and make sure you understand them. After all, you are paying for the service that your insurance provides. Knowledge of your healthcare coverage can save you money!​ If you have any questions about your health care benefits, please call the toll free number located on the back of your insurance card. Matossian Eye Associates congratulates Nora Saunders, daughter of Cynthia Matossian, MD, FACS, on her recent engagement to Morgan Dunnan. We wish them much happiness in the year to come as they plan their wedding! 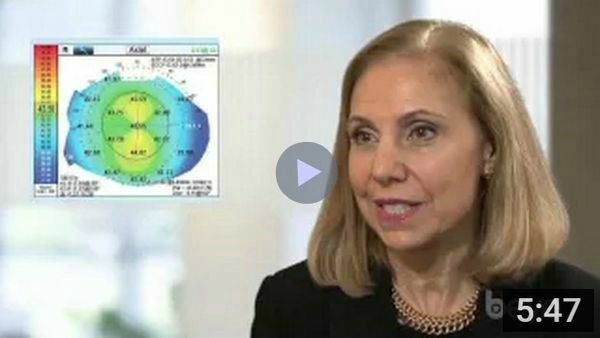 In the video below, Cynthia Matossian, MD, FACS discusses her experience using the OPD-III in order to customize the implant for each eye for optimal post-operative outcomes. Blephadex™ Science Base Lid Care is a new doctor recommended lid wipe to help relieve the symptoms of Blepharitis. By using Blephadex™ every other day, you can effectively remove excessive oils and debris that may cause redness, itching, or dandruff-like scaly build-up on your eyelid margins. The cost of Blephadex is only $20 a box and is available at all three of our offices. At Matossian Eye Associates, we carry a variety of products for the convenience of our patients, researched and hand-selected by our physicians. No need for an appointment, just stop by to make your purchase! Daniel Jaramillo Velasquez, a 4th year medical student from Bogota, Colombia, recently spent a month as an intern at MEA through the AMO Worldwide program. AMO Worldwide places international students in four-week clinical clerkships to obtain hands on experience in a selected field. Princeton University undergraduate student Hanley Ong recently shadowed Cynthia Matossian, MD, FACS for a day. Interested in medicine but not yet certain of the specialty, Hanley hopes to observe many medical practices before deciding. 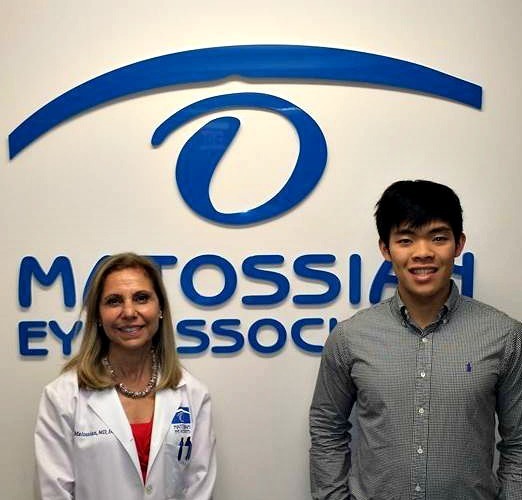 At Matossian Eye Associates, we offer students an educational opportunity to learn about the field of ophthalmology. MEA's Judy Collier passed all the necessary exams and is now a Certified Ophthalmic Assistant. Congratulations to Judy. Ilya Rozenbaum, MD had the honor of performing a peer review of a glaucoma research paper in Clinical and Experimental Ophthalmology about glaucoma surgery outcomes in African American patients. Cynthia Matossian, MD, FACS will be participating as faculty at the upcoming MillennialEYE Live 2015 Meeting in Los Angelos, CA, September 25-27. Cynthia Matossian, MD, FACS was interviewed for the article, "A More Modern Fish Story" in the August 2015 issue of EyeWorld, please click here to read the article.